Cinema has served as a powerful tool forged in the history of war – either as a glorifying force of propaganda or a condemning revelation of its morbid realities. Three films presented this month at Roxy Cinema Tribeca put forward artful representations of the genre of the War Film, each with the unique perspective of a consummate filmmaker. Three Kings (1999) was a transitional film for David O. Russell who began his career with black psychological comedies such as Spanking the Monkey and has since risen to Academy Award prominence with Silver Linings Playbook and American Hustle. Controversy arose around Russell’s script adaptation which derived form a story by screenwriter John Ridley, who himself would earn an Oscar for best screenplay in 2015 for Twelve Years a Slave. The object of Russell’s satire levels to its bleakest depths within the film, with a story of renegade soldiers (George Clooney, Mark Wahlberg, Ice Cube, Spike Jonze) taking up a treasure hunt for Iraqi spoils. The Gulf War is depicted as a poorly organized romp of senseless pillage, and the storyline prophesies the grave repercussions of the Iraq War in 2004. The film has a broad stylistic approach blending elements of satire and action with familiar, yet inventive, tropes of the war drama. Despite the comedic veneer, the film is deeply sensitive in its treatment of the subject matter, and innovative in its cinematography. It garnered critical acclaim and public popularity, and was dubbed by The New York Times as “the most caustic anti-war movie of its generation.” It extends its satirical scope to target the role of media in its obscuration of public perceptions of warfare from its opening scene, where a journalist hungry for relevance (SNL veteran Nora Dunn) poses the question of invoking the “Spirit of Vietnam with a clear moral imperative” to a cadre of disengaged and dumbfounded soldiers. Three Kings will screen on June 10th at 8:10pm. The most notable cinematic invocation of Vietnam from the generation preceding Russell’s must be Francis Ford Coppola’s Apocalypse Now (1979). Joseph Conrad’s Heart of Darkness forms the outline of the film’s plot as an analysis of imperialism, racism, and the sordid potentialities of the human mind. Coppola’s analysis of war similarly begins with an aura of satire, marked by his penchant for baroque character development executed by a formidable cast. Robert Duvall plays the cavalier Lieutenant Colonel Kilgore with hints recalling Doctor Strangelove. Lawrence Fishburne aged fourteen makes a potent impression as a G.I. from the South Bronx, as does Sam Bottoms as a stoned celebrity surfer. The narrative pace soon sheds its lighter touches as it builds to encroach upon territory of metaphysical horror. Martin Sheen stars as Captain Benjamin Willard, an elite assassin possessed by an existential curiosity as he commands a secret mission to terminate the rogue Colonel Kurtz, played by Marlon Brando with a look half reptilian and half divine after having transformed into the leader of an eclectic warrior cult in Cambodia. Dennis Hopper delivers muttering rants tinged with verses of T.S. Eliot as one of Kurtz’ dropped-out devotees. The Academy Award-winning cinematography is supernatural in quality, lush with lighting and location, and pagan in its vision. As in Conrad’s novella, the river seethes like an abyss upon which Willard leads the crew into uncertain peril. Swarms of helicopters slashing jungles with napalm, opium laced love scenes in French plantation manors, and bizarre occult rituals in ruined temples progressively derange the senses with sinister exoticism. It is a masterwork of storytelling and a penetrating exploration of the ineffable psychology of warfare. 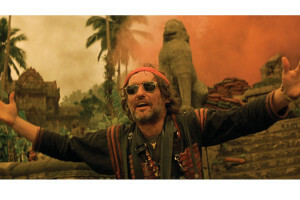 Apocalypse Now will show on May 26th at 5pm. The greatness of Apocalypse Now as a film and a war film can be compared only to The Deer Hunter by Michael Cimino released one year prior. Where the former extends its reach toward the cosmic, The Deer Hunter examines the realm of commonplace experience with a realism both stark and vivid. The cast is infallibly strong in conveying this style, offering up some of the finest performances ever given by powerhouses including Robert De Niro, Christopher Walken, Meryl Streep, John Savage and the final performance by John Cazale (The Godfather, Dog Day Afternoon) before his passing from cancer shortly following the film’s completion. The first act introduces a clique of youths in a working-class Pennsylvania town of Russian immigrants. Stevie (Savage) is about to be married before shipping off to Vietnam, along with his friends Mikey (De Niro) and Nick (Walken). The hour-long wedding scene demonstrates the grandeur of Russian Orthodox Christianity with its architecture and pageantry. The youths drink and dance extravagantly in their tradition, but yearn for a sense of American identity through nationalism and sacrifice. Each of their complex longings and frailties are poetically exposed through the cadence of their relationships and the power of the performances. The second act transitions abruptly to Vietnam, where rather than a progressing series of scenes or montages detailing the war experience of the characters, the film delivers only a single pivotal real-time sequence whereby they are indelibly transformed. The action is so well constructed in its intensity and psychic strain that the trauma unique to each, combined with their individual responses, set the course for the final act in which each will process his new identity after completing his service. For a full cinema schedule and to purchase tickets, please visit Roxy Cinema Tribeca.